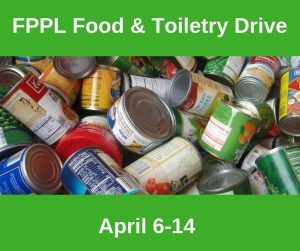 The library will be collecting food and toiletry items from Saturday, April 6 through Sunday, April 14. Community members can pay off their fines with the donations or simply donate. A program to collect non-perishable food and toiletry items to stock our Little Free Pantry and the Forest Park Food Pantry in exchange for paying off library card fines. Some people may just be donating items without wanting to use them for paying off fines. FPPL Cardholders may bring in up to 20 non-perishable food items. Each item will be worth $1 in fines. For example, if you have $3.50 in fines, bring in four items and we will zero out your fines. Food for Fines includes all FPPL fines (payment for items returned late). This program will not include fees (payment due for lost items) or fines from other libraries. What type of items should be accepted? The library will not accept expired food, open packages, repackaged foods, homemade or home-canned foods, medications, and products not in their original packaging. Where should items be dropped off?